A holiday favorite 'round my family when I was growing up was my Mom's Fresh Apple Cake. 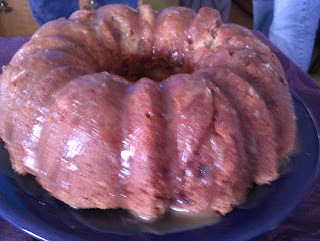 A very simple bundt cake that was reasonably light, tasty, and well received. I've in past generally reserved it for Fall and Winter holidays, but with Easter brunch approaching, I decided I had a craving. While searching for comparable recipes, I noticed that it is a very popular and common dessert and there are lots of permutations (even with different fruit!) that allow for interesting options and flavors. This recipe includes a glaze that my Mom didn't often include, but I've found that it adds an extra but subtle sweetness that compliments the otherwise mild flavored cake. Grease/butter the bundt pan thoroughly (use a brush if necessary) and flour. I like to sprinkle in a little bit of extra cinnamon in with the flour to give the cake a nice crust. Allow to completely cool before trying to release from the pan. Heat in a double boiler (or an equivalent) until thick. Drizzle over the top of a cool cake. I made it myself! How hard could it be?